Step 1 – Buy a mug: You will need a mug to drink out of. To do this you will need to go out and buy one, and no, you can’t just use the Washing Up powder dispenser or a glass. Step 2 – Buy a kettle: You will need a kettle to boil the water. So once again go and buy one instead of borrowing one from the dodgy looking bloke living next door. Step 3 – Buy some tea bags: You should be getting the big picture now, go out and buy some tea bags. Step 4 – Boil the water: Using the tap, pour water into your kettle and heat it up. When the water is bubbling, it is ready; if unsure, stick your finger in it, if you shout “OW”, it’s ready. Step 6 – Put a tea bag in your mug: Get a teabag from your new supply, place it in your mug, stand back and impress your friends. Step 7 – Add the water: Add the water from the kettle making sure it is as hot as when you added the personal touch from step 4 to your mug and tea bag. Step 8 – Mix the ingredients: Using a spoon, mix the tea and water until it goes brown. If you don’t have a spoon, you can use your finger again like in Step 4 in which case you may want to repeat Step 5. Alternatively, you can just repeat Steps 1, 2 or 3 with a spoon as the subject. What do you mean you can’t remember Steps 1, 2 or 3? Have you not been paying attention? Step 9 – Add some milk: Take some milk from the fridge and add it to your mug. What do you mean you don’t have any milk? well in that case………. Step 10 – Buy some milk: Follow steps 1, 2 or 3 again, this time with milk (and maybe sugar if you want some) and then repeat Step 9, seriously the people I have to work with. 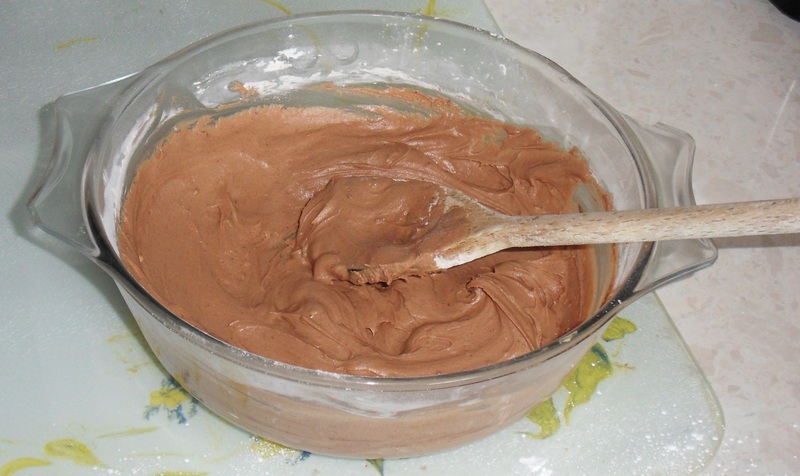 Step 11 – Stir again: Stir the mixture once again. Step 12 – Remove the tea bag: Remove the tea bag from the mug, stand back and impress your friends once again. Step 13 – Take a drink: Grab the mug handle, raise your little finger and take a sip. If you have done everything it should taste great, if not, then it is obvious that you have not been paying attention. If all this fails, there are 2 other ways to make a cup of tea. Go to Starbucks like you’ve been doing for the last 3 years, or failing that………. Stand up in the middle of the room and shout to the top of your voice the following sentence: “WHAT HAVE I GOT TO DO TO GET A CUP OF TEA ROUND HERE”. Yes, your eyes do not deceive you, it says Oreo Cake, it is a cake with Oreos in it and looks like an Oreo. The Idea came to me a few months ago and after some experimentation the cake is Brilliant. So if you would like to make it you will need the following ingredients. Now this recipe is very similar to the Chocolate Cake recipe but it is a little bit different so pay attention. You can make your cake a bit bigger by doing 8 oz. ingredients (except for Cocoa – either keep it the same or increase, but not too much) and 4 eggs if you want to. Preheat the oven to Gas Mark 4/5 on the middle shelf or top shelf if you are brave enough, or if you are using a fan assisted oven it is about 160-170° (please refer to your user manual for which shelf and temperature to be sure). 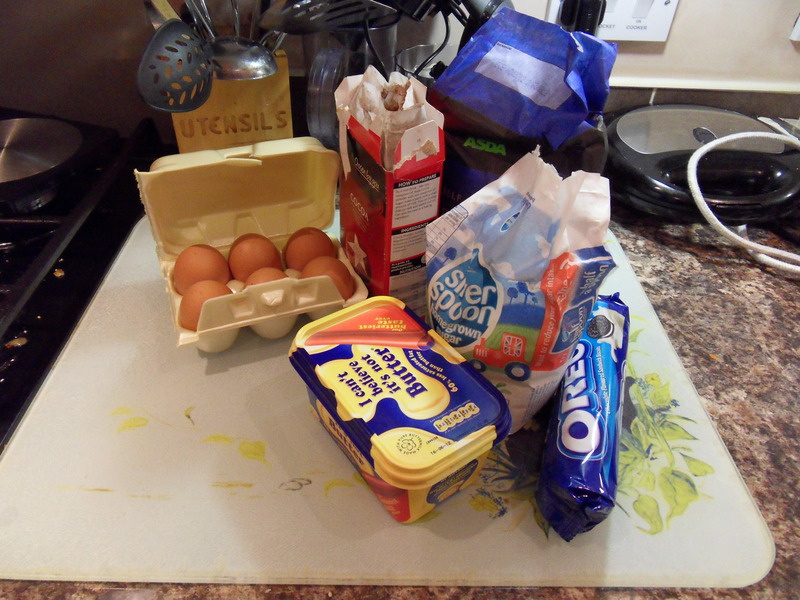 Weigh out your ingredients (except the Oreos) and put them into a large-ish bowl and then mix together using an electric whisk on a slow speed until it is all nicely together, then put it up to full speed until the cake mixture is nice and soft and a light brown colour. Stop the whisk, then using a knife go around the edge of the bowl and take any of the mixture that is stuck to the sides of the bowl and move it into the rest of the mixture. Then whisk again on full speed for a few more seconds to make sure it is all nicely together. The right consistency to go for is simple, take a spoon and (using the spoon) pickup some of the mixture and then plop it back in (the mixture), if it plops off the spoon naturally without any help required then the mixture is at the right consistency, this also applies for the chocolate cake (but I forgot to mention that, MUHAHAHAHAHAHAHAHAHAHAHAHAHAHA). Now get a food processor (machine with blades in that can mix food up) and then get your Oreo packets, make sure that when you open it that it has Oreos in it. Then break them ALL (it is important that you use ALL the Oreos in a full packet, if it is not a full packet – get a full packet) up and put them in your food processor. 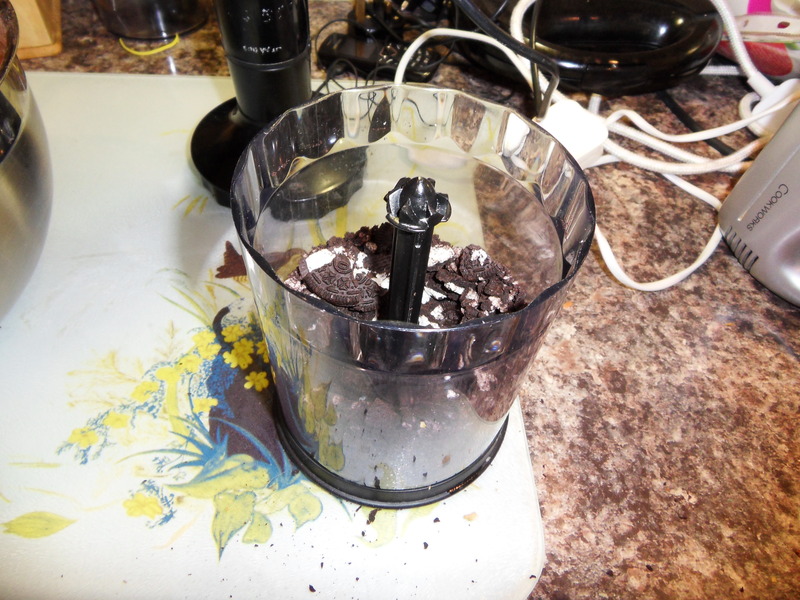 Turn the Food Processor on (you may want to put a lid on if it does not have one) and then initially pulse the Oreos until they are all nicely broken, then hold down the button (no longer pulsing) until the Oreos are in tiny pieces (almost like a fine powder). Then pour in the Finely Powdered Oreos into you cake mix and then stir them into the mix, what you want to achieve is a granite like effect (if you have a granite work surface, look at it and then imagine it brown), you can use the electric whisk if you want to but it may be better to use a spoon. 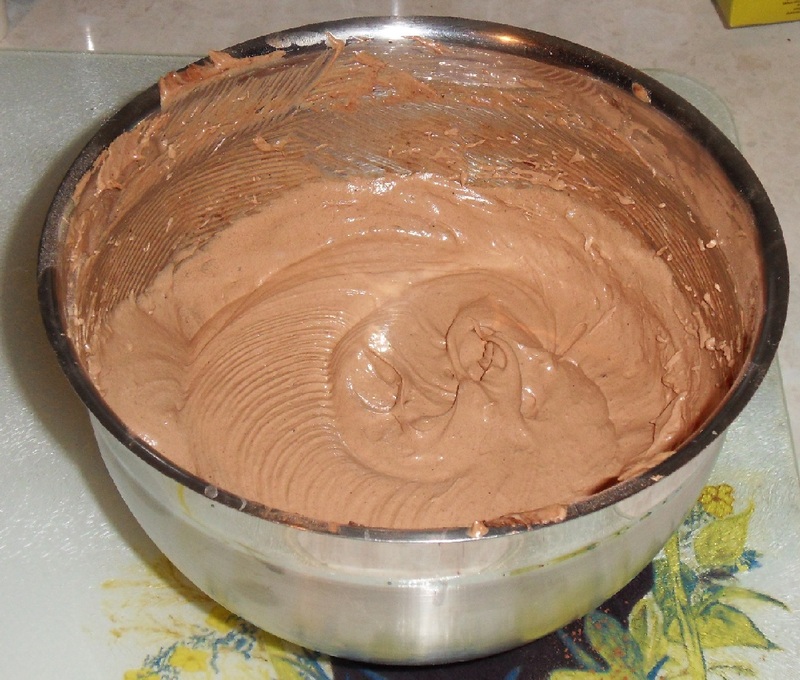 Once it is nicely mixed together pour the mixture into two greased cake tins (thin with a big diameter, refer to Chocolate Cake recipe on greasing) and then place them in the oven. After about 30 minutes check on them and do the skewer test, if they are ok take them out of the oven and let them cool in the tins for a couple of minutes and then take them out the tins and put them on a cooling rack. After you have let them cool down for a while it is time to do the icing. 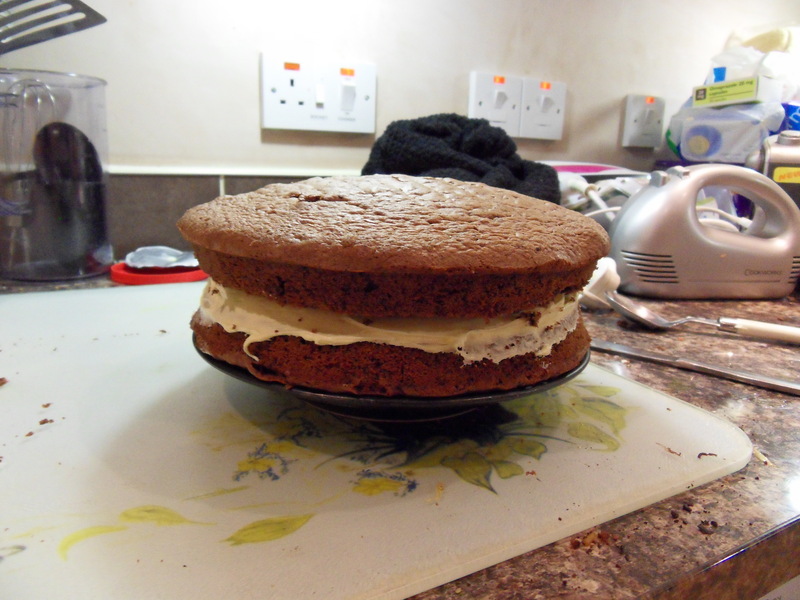 Take one half of the cake and make sure that the flat bottom is facing up. 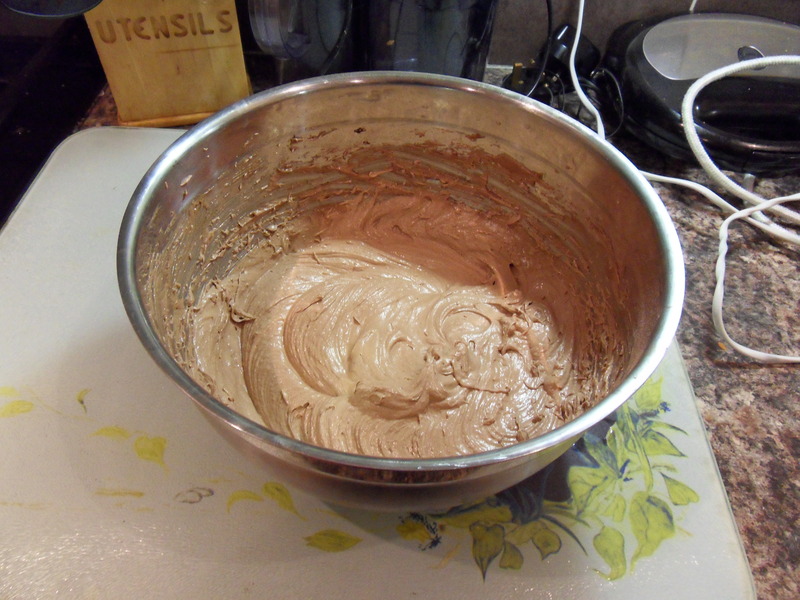 Then take out all the icing from the tub and smoothly spread it around evenly. 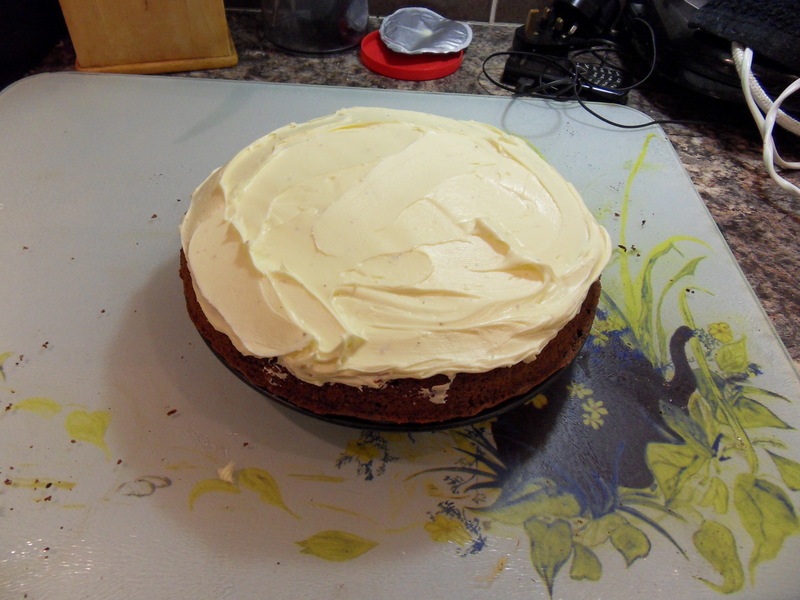 Then take the other half and place it on top with the flat bottom facing down (towards the icing). 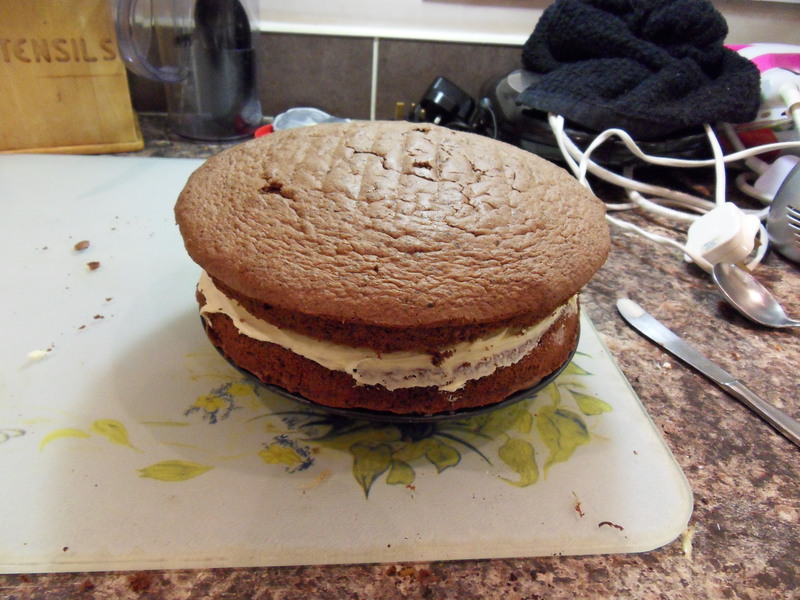 Then smooth the icing around until it is all nice and tidy. Your Oreo Cake is now ready to eat. 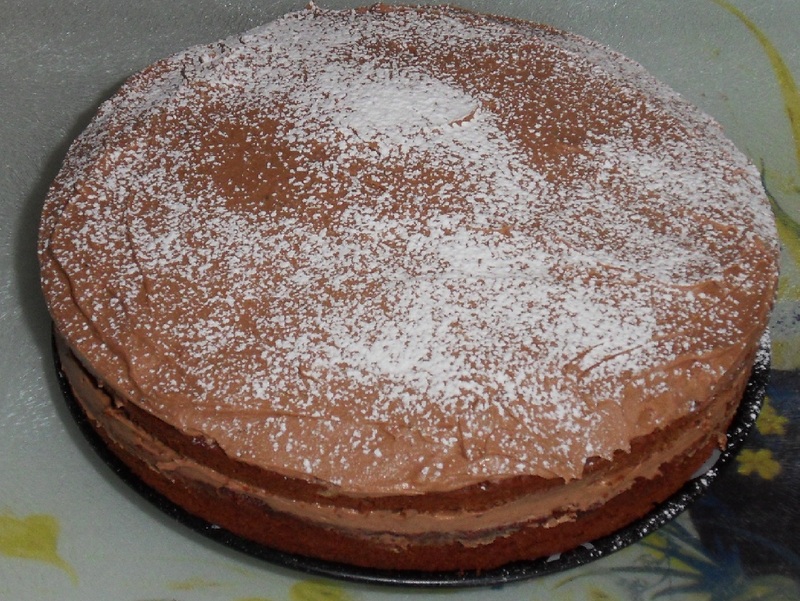 Chocolate Cake is one of the easiest recipes to do and does not come with extra surprises that you may find in a coffee shop Chocolate Cake (like Jam). This recipe tells you how to make a Simple Chocolate Cake that is just Chocolate and no hidden extras (like Jam). Pre-heat the oven to Gas Mark 4/5 I usually put it in the middle (if you don’t have a Gas Mark Oven……….). Weigh out your ingredients into a large-ish bowl, you can sieve your flower into the bowl but I usually don’t. Then using an electric whisk mix the ingredients together, start on a slow speed and then go at Full Speed. Then when the ingredients are mixed together stop the whisk and then using a knife scrape off the mixture from the walls of the bowl and into the main mixture. Then use your whisk again at Full Speed (Muhahahaha) and make sure that all the mixture is completely mixed in. 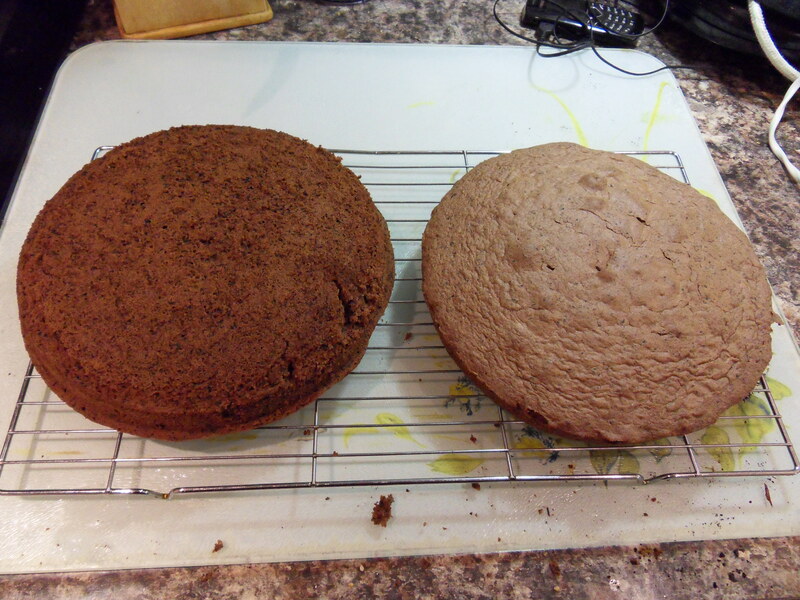 Put the mixture to one side and Grease 2 cake tins (short in Height but wide in Diameter). I prefer to use margarine, put a dollop of margarine in the tins and then use some kitchen roll to spread it around the tin until the whole tin is covered (LIGHTLY), and then repeat for the second tin. Then pour the mixture evenly into both tins, then spread out with a knife. Put your tins on the top shelf of your oven and cook for 30 Minutes, and then lick the bowl. After 30 Minutes take the tins out of the oven and use a skewer to test if they are ready. Basically put the skewer in the cake and take it out, if it comes out clean your cake is ready, if it is not clean it is not ready, put it back in the oven for a few more minutes then test it again. When your cake is ready give it a few minutes to cool down and then remove the cakes from the tins and put them on a cooling rack to cool down (obviously). Your cake is now ready for some icing. Weigh out your icing sugar and cocoa into a jug (it helps when mixing the sugar), put no more than 1 oz. of Cocoa in the mixture (if you put in 0.4/0.5 oz. you can make it look nice and light – almost like coffee). 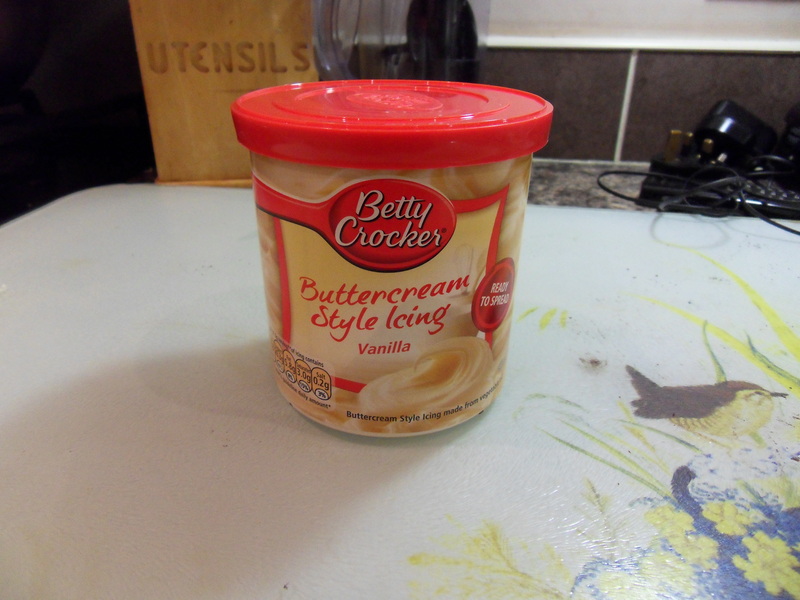 Separately weigh out you margarine and put it into a (different) mixing bowl. Mash up your margarine with a fork until it is nice and soft. Then pour some (not all) of your icing sugar and cocoa into your margarine bowl and mix it round with a wooden spoon. Continue to do this until all the icing sugar is mixed in. Then take one cake (one tin) of your two-part cake and put a big dollop of icing on it and then spread it around with a knife or spoon. The put the other cake and put that cake on top of the cake with icing. 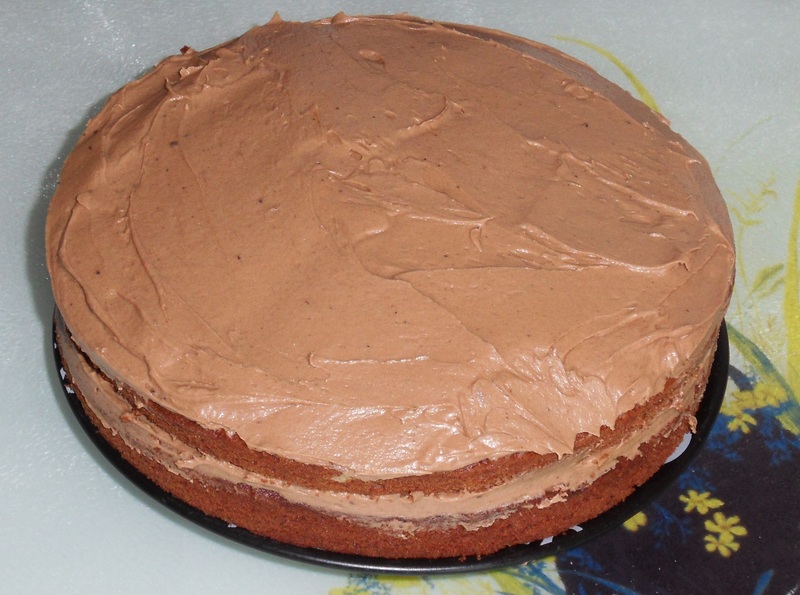 Then add the remaining icing to that cake remembering to spread it around evenly. Once that is done tidy the cake edges by removing excess icing from the edges just so it does not drip all over the place and then lick the icing bowl. Finally you can either leave the cake alone or decorate it with Chocolate Sweets, Hundreds and Thousands, Coconut (not a whole one) or with just Icing Sugar through a sieve like I did. Your cake is now ready to eat.